Welcome back to another Freebie Friday! In keeping with my free printables for autistic children, this week I’m sharing a weekly chores chart printable pack. Sweet B does help around the house and sometimes it helps her to have a visual reminder to keep her on track. Mostly she helps with making her bed, and sorting silverware. We’re slowly adding in more chores and responsibilities for her as she gets older. 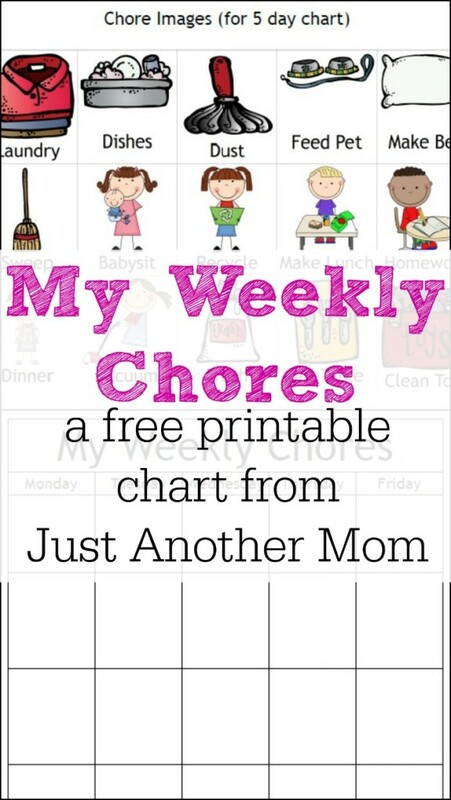 You can also use the blank charts to write in chores. While I wouldn’t exactly use these in a visual schedule, you can certainly integrate them into one. For example, if you’re trying to increase your child’s independence, this might be a good place to start. You can also use these for a younger child who is starting to show interest in helping but may need some guidance. Squeaker, for example, helps us out with feeding the cat, picking up her toys, and making her bed. Yes, she is a toddler and yes, she does chores. Not always well, but she wants to help. When she’s older, we might integrate an allowance into that but until then, it’s just a few simple chores that a toddler can handle. I will be updating this pack soon, or expanding on it, to include more chores and settings. I am also considering a purchase of the Boardmaker software so if I purchase that; all of my packs will be getting add-ons. That’s still a little bit down the road though as I don’t quite have the money yet! I should also add that most of my packs will continue to remain free. I want to help fellow special need moms and caregivers in whatever way that I can. Eight Free Autism Downloads – The Little Puddins Blog.